The First Ladies Gold Coins series (known formally as the First Spouse $10 Gold Bullion Coin series) honors the spouses of the United States Presidents by depicting their portraits and important events or causes from their lives on half ounce gold coins. This series is being issued in conjunction with the Presidential Dollars that honor their husband's terms in office, and will be issued at the rate of four per year until at least 2016. While most Presidents had a First Lady, not all of them did, so special designs have been mandated for those instances. It is hoped that the issuance of these coins will help illuminate the lives of these important women, as well as educate people about the life and times of the Presidents and their spouses in a more general context. This photo gallery will serve as a starting point for your own exploration of the lives of America's First Ladies. The obverse of the Martha Washington First Spouse coin depicts a woman who doesn't look very happy. I'm disappointed that the designers have elected to use unsmiling images of these historical women, and although the Martha Washington portrait isn't as bad as some of them, it's a shame that she doesn't look more vibrant here. The obverse designer and engraver was U.S Mint medallic sculptor Joseph Menna. Learn more about the life of Martha Washington, or see the George Washington Presidential Dollar. Comparing the actual Martha Washington gold coin (depicted here) to the artist rendering (previous page) we can see that artist and engraver Joseph Menna was able to soften Martha's features a little and add some spark to her portrait. I think she looks much better on the actual coin than she did in that rendering. Martha Washington's First Spouse coin reverse depicts her sewing a button onto her husband's Continental Army officer's jacket. Martha was well-beloved by the soldiers during the Revolutionary War because she demonstrated a great deal of care and concern for them and their needs, and was known to intercede with her husband on their behalf at times. Thus has she earned the appellation, "First Lady of the Continental Army." 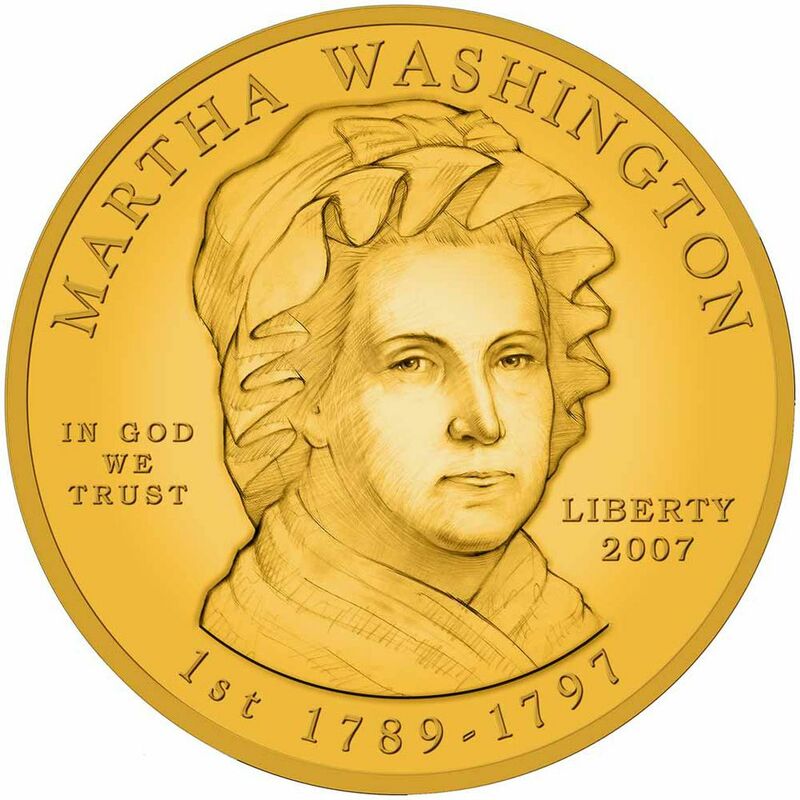 Martha Washington's First Spouse coin was designed by Artistic Infusion Program Master Designer Susan Gamble, and engraved by U.S. Mint sculptor-engraver Don Everhart. Once again, comparing the artist rendering to the actual coin, we can see that the engraver (Don Everhart) made subtle changes to the officially approved rendering (designed by Susan Gamble.) The most noticeable change is that Martha Washington seems to be looking up at the viewer of the coin here, whereas in the rendering she seems totally focused on her stitching. The Abigail Adams First Spouse coin almost makes me mad! By all accounts, she was an extremely intelligent, vibrant woman who urged her husband, second U.S. President John Adams, to remember women's issues as well as the concerns of men when he was leading our nascent nation. She carried on an active correspondence with her husband, family, and friends while managing his business interests and farm while he was in office. I really don't comprehend why the designers of this coin had to depict her as a frowning, dour-looking old matron. The obverse designer and engraver was U.S Mint medallic sculptor Joseph Menna. Learn more about the life of Abigail Adams, or see the John Adams Presidential Dollar. The artist rendering for this coin was, in my opinion, the worst for all four of the First Spouses for 2007. Abigail Adams looks like a sour old hag on the previous page, but fortunately engraver Joseph Menna was able to salvage this horrific design to some extent. Abigail's face is a little more rounded, which gives her a softer appearance, and her lips are rendered in a kinder way so that she doesn't look like she's perennially scowling. This is a great improvement, but I still don't understand why these historical women are being portrayed more as biddies than as ladies. The reverse side of Abigail Adams' First Spouse coin is a lot more flattering of her than the obverse! Here, she is depicted as a younger woman, in the act of writing a letter. In fact, she left a remarkable legacy of letters to a wide variety of correspondents, chronicling the fears and privations of the Amercian Revolution from a woman's perspective. As the coin which honors her states, she implored her husband to "remember the ladies" (and their needs and challenges) as he participated in drafting the documents that would form the basis of law for our nascent nation. Abigail Adams' First Spouse coin reverse was designed by Artistic Infusion Program Master Designer Thomas Cleveland, and engraved by U.S. Mint medallic sculptor Phebe Hemphill. Thomas Jefferson, the third U.S. President, was a widower by the time he took office. His wife died in 1782, nearly 20 years before he was elected, so the designers of the series decided to feature Miss Liberty on the obverse of his "First Spouse" coin. This portrait of Miss Liberty is modeled after the Draped Bust Half Cent, which was minted from 1800 to 1808. In this case, I think they've made a bit of an improvement over the orginal coin design. The original half cent coin was designed by Robert Scot. This re-engraving was done by United States Mint mecallic sculptor Phebe Hemphill. See Thomas Jefferson's Presidential Dollar coin. The architects of the First Spouse coin series had a bit of a quandary to solve when it came to presidents who were bachelors or widowers when they took office. Should they feature the deceased spouse for the widowers? But she was never a First Lady, so how can you paint her as equal to the Ladies who did serve with their husbands? And what about the bachelors? Should they use the presidents' favorite girlfriends? Obviously something more generic was needed in these cases, and with Thomas Jefferson's First Spouse coin, we see the first of the "non-spouse" designs. These designs will all (except one) be based on renderings of Miss Liberty that appeared on U.S. coins that circulated during the president's term of office. The exception will occur for the First Spouse coin for President Chester Authur, which will depict suffragette Alice Paul. Personally, I don't like the idea of re-using classic coin designs in this manner. This was a wonderful opportunity for Congress (who determines the images on our coinage) to honor some of the important women throughout U.S. history. Instead, we're getting repeats of the national goddess which teaches us nothing new about our past. I wonder if we can get the Presidential $1 Coin Act (pdf doc) amended. Write to your Congressperson! Because Thomas Jefferson's spouse died almost two decades before he became President, the U.S. Mint placed a tribute to Jefferson himself on the reverse of his First Spouse coin. Jefferson has always been renowned for his facility with the written word, and even at his death it was found that he had left exact instructions for what words should appear on his tombstone. The reverse of Jefferson's First Spouse coin records those words. Thomas Jefferson's First Spouse coin reverse was designed and engraved by U.S. Mint sculptor-engraver Charles Vickers. Dolley Madison actually looks a lot younger, and is depicted more flatteringly, than the ladies on the first two First Spouse coins. I wonder if the better treatment she got is because her name is more well-known than the other first ladies, and people have a good feeling in general about her name because of the line of sweet treats named after her. Seriously, she was a well-beloved first lady in her own time, and a leading American socialite for nearly fifty years. Dolley has always been well-liked, and perhaps that is why she fared better than others in the artistic remembrance of her that she enjoys on this coin. The obverse designer and engraver of the Dolley Madison coin was Don Everhart, a U.S. Mint sculptor-engraver. Take a look at the James Madison Presidential Dollar. Don Everhart was the sculptor and engraver for the Dolley Madison First Spouse gold coin. I think the gold coin design is an improvement over the artist rendering (previous page,) especially around Dolley's eyes. In the artist rendering, she seems to have heavy dark circles under her eyes which don't show on the actual coin. On the other hand, her confident facial expression on the rendering turns into a smirk in the coin engraving. It's interesting how minor details can totally change the viewer's perception of things. Dolley Madison is credited with saving important State and Cabinet Department papers, plus the famous portrait of George Washington painted by Gilbert Stuart, as the British troops bore down on the White House in 1814. It is this patriotic act which is memorialized on the reverse of her First Spouse gold coin. Dolley Madison First Spouse coin reverse design by Artistic Infusion Program Master Designer Joel Iskowitz. Engraved by U.S Mint sculptor-engraver Don Everhart. Prolific stamp and coin artist Joel Iskowitz created the design that the Dolley Madison First Spouse gold coin reverse is based on. In the artist rendering, I thought the proportions were excellent, and this was my favorite reverse design among the 2007 First Spouse coin designs. However, I'm not happy with the way Don Everhart engraved this coin. Dolley is almost lost in the added details of the Washington painting behind her. Also, I know this nitpicking but, I think Joel's initials, where they're placed (on the left on the floor) are distracting from his lovely design. I don't know whether he chose this placement or not, but it could have been more subtle. Now, having nitpicked about the initials, I want to say that in general I think our fabulously gifted coin and stamp artists here in America get nowhere near the public recognition they should get. Most Americans probably can't even name a single coin or stamp artist, although Glenna Goodacre (best known for the Sacagawea Dollar) has made some modest inroads toward becoming a household name. This is an artist's rendering of the Elizabeth Monroe First Spouse gold coin. She is depicted wearing a scarf around her head, in what seems to be a conservative manner of dressing. However, as the reverse of her coin shows (next image,) she may not have been so conservative after all! She was First Lady from 1817-1825 during her husband James Monroe's Presidency. The obverse of her coin was designed by AIP Master Designer Joel Iskowitz. Elizabeth Monroe was First Lady from 1817 to 1825, during her husband James Monroe's Presidency. Elizabeth ran the White House like a European royal court, and the coin shows her wearing a crown of feathers and an ermine wrap. The head-scarf is still there, too. I can't help but wonder if the head-scarf was a form of tiara or crown in Elizabeth's own mind. Perhaps it was studded with diamonds or pearls or something? The coin, designed by AIP Master Designer Susan Gamble, refers to the official reopening of the White House in 1818 following its restoration after being destroyed by fire by the British during the War of 1812. The Monroes sold the government most of their furniture, since the White House was almost empty at the time. In fact, it actually became the White House when the Monroes had it painted white in 1818! Louisa Adams was the wife of President John Quincy Adams, and she was First Lady from 1825 to 1829. Louisa was born in England, and was far more comfortable with the ways of a royal court than she was with that of rural colonists. Looking at her image on this coin, I can't quite decide whether she is wearing an outright tiara or whether that's just a piece of fine lace, although it's probably the latter. Either way, it's quite an ornate hairstyle, and very pretty looking. The coin's image, engraved by U.S. Mint Sculptor-Engraver Joseph Menna, is based on a famous portrait of Louisa Adams. One thing that struck me right away about this year's crop of First Spouse coins: the women are depicted young and beautiful, in the prime of their lives, rather than as sour-faced dowdy old matrons we saw on the Abigail Adams and Martha Washington First Spouse coins! I think this is a wonderful change, and makes these historic ladies much more appealing. The reverse of the Louisa Adams First Spouse coin depicts Louisa with her son, Charles, in Paris during one of their many difficult trips throughout Europe. The theme for the coin is "Traveling Across Europe," and was designed by AIP Master Designer Thomas Cleveland. John Quincy and Louisa Adams traveled extensively as part of his work as a diplomat for the nascent United States of America. Read more about Louisa Adams from the About.com Guide to Women's History. Rachel Jackson's story, as it relates to her status as America's First Lady, is tragic. The official White House account states it so eloquently: "Wearing the white dress she had purchased for her husband's inaugural ceremonies in March 1829, Rachel Donelson Jackson was buried in the garden at The Hermitage, her home near Nashville, Tennessee, on Christmas Eve in 1828." Because Rachel Jackson never got to enjoy the honor and privilege of serving as First Lady, her husband Andrew Jackson's First Spouse coin depicts Miss Liberty as she appeared on the Capped Bust Half Dollars which circulated during Jackson's tenure as President. The coin's obverse was designed by John Reich. Andrew Jackson's wife died shortly before his inauguration, so the reverse of his First Spouse coin depicts Jackson himself astride a horse, wearing his military uniform. Jackson served as a Major-General in the War of 1812, and was extremely popular with the lower classes, having risen up from a backwoods settlement himself. Although there are conflicting explanations for how Jackson acquired the nickname "Old Hickory," the most reliable seems to be that his soldiers called him this, because his steadfastness was comparable to that of hickory wood, which is very hard. Jackson's First Spouse coin reverse was designed by AIP Master Designer Justin Kunz. Martin Van Buren's wife Hannah died at the age of 35, probably of tuberculosis, 18 years before he became President. Because she never served as First Lady, Van Buren's First Spouse coin depicts an image taken from a coin which circulated during his tenure in office - the Seated Liberty Dime. The coin was designed by U.S. Mint Engraver Christian Gobrecht. The most frequently asked question about this coin design is, "What is Miss Liberty holding on the top of that stick?" The "stick" is actually a staff, denoting authority, and the "thing on top" is a traditional Liberty Cap! Liberty is seen seated on a rock, a device that has been appearing on coins since ancient Roman and Greek times when City and State Goddesses were often depicted sitting on rocks, often with rivers flowing at their feet. Because Martin Van Buren was a widower by the time he became President, the reverse of his First Spouse coin depicts a theme from his life. Van Buren was born in a small Dutch community located at a way-point between major cities. As such, it was frequented by important men, including the politicians of the day, who had to travel often. The young Van Buren was a keen observer of the discourses among these men, and he undertook to become a part of the political scene, working his way up the party ranks until he became Andrew Jackson's second Vice President, and eventually President himself. The coin's design, created by AIP Master Designer Thomas Cleveland, is emblematic of Van Buren's formative years. Are Obama Coins a Rip-Off?